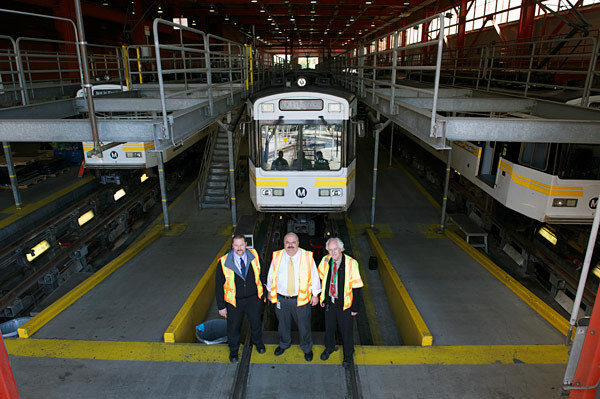 Rail Fleet Services team oversee the rail car overhaul program at the Metro Blue Line maintenance facility. From left, Brian Rydell, Nick Madanat, Russell Homan. Photos by Gary Leonard. The hefty Metro Blue Line rail cars make a hard day’s run between Long Beach and downtown Los Angeles, running the 22-mile stop-and-go course to the tune of 87,000 trips a year, 1.7 million service miles and 26 million boardings. 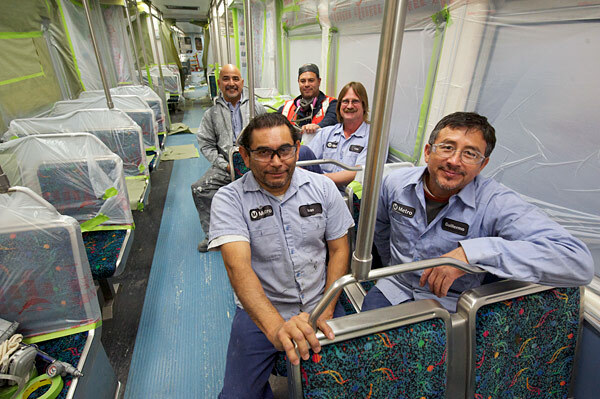 Although the rail cars of the Blue Line’s original fleet are not slowing down — some have been running for two decades now — the cars are in the midst of a comprehensive overhaul of rail car components and systems that impact safety and reliability and appearance. In the works for more than a year now, the $30-million rail car overhaul program will enhance and extend the revenue service life through the projected 30-year life span of the cars. Fresh out of the paint shop, this rail car is refurbished inside and out. The work is being done in the cavernous vehicle maintenance buildings of the Blue Line rail yard in Long Beach. Scores of maintenance specialists are poring over rail cars that pull in and out of the rail yard pit stops. 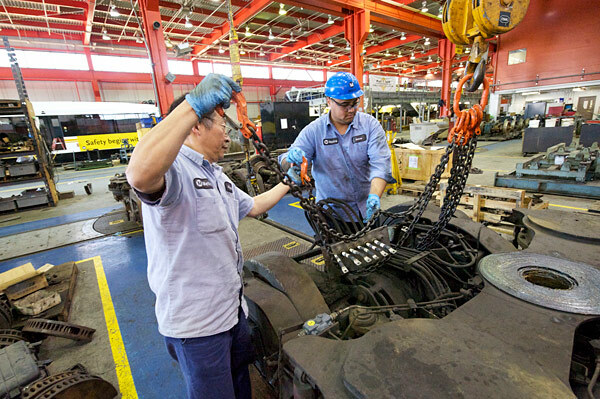 With only six years to accomplish the overhaul, the tasks are handled one set of components at a time — in a fashion that keeps the overhaul process moving while providing cars for service each day. Activities underway for 2012 include overhauls of heavy-duty motor, wheel, articulation, gearbox, overhead wiring and HVAC (air conditioning) systems, along with a complete interior and exterior refurbishment that includes new paint, windows and new passenger seat cushions. 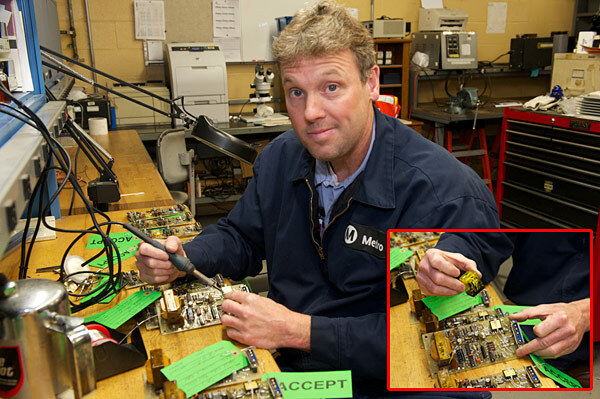 Maintenance specialist Steve Parker modifies a circuit board. Parker and co-worker Gordon Lancaster keep the shop in stock in hard-to-find circuitry replacement parts. In the electronics shop, where experts modify circuit boards that convert current for overhead power, drawers of replacement parts are regularly mined for intricate tasks such as converting a mechanical relay to solid state circuitry. The in-house electronics shop, a vital function of the maintenance yard for some 15 years now, eliminates the delay of repairs from an outside vendor and a great deal of the cost. Although procurement is underway to order new light rail cars — including options to purchase some that would replace the original Blue Line fleet — the maintenance program will keep the Blue Line running and in good shape until the new cars are delivered. The photos here show various components in stages of overhaul, repair and replacement. Paint shop crew. Back row: Jim Reyes, left, Alan Cota right, Center row: Lee Hetherington. Front row: Ivan Rodriguez, left, Guillermo Hernandez, right. Alex Apodaca preps gear box for overhaul. If this is happening now I guess that is why the Blue Line is slow or down many times a day lately. I can’t count the number of times each day I see delay or total failure of trains every day over the past few weeks. I am afraid to take the Blue Line anymore as I can’t trust that I will get where I am going on time or at all. The buses are much slower but they seem to run better than the Blue Line Trains do. This overhaul is way overdue and with only a few people doing the work it seems like it will take forever. Its good that they are overhauling the LRV’s. The only thing I would suggest is upgrading the Headsigns to LED signs. Something similar that you see on on the Breeda Vehicles or Metro’s bus fleet. It just to get things up to speed. This is cool, but I was hoping for more visible improvements. Basically all the worn parts are getting replaced and the interior is just getting cleaned up. I would have liked to see the old rolling signs replaced by more modern and more practical LCD signs — especially if a car has to run on both the Blue and Expo lines. Those cars are only 20 years old. San Diego is now selling their 32 year old Light Rail cars in working order to Argentina! I appreciate seeing the overhaul, its a much needed improvement. As a daily rider of the Blue line, I have to agree with the previous comments, I dont care about an upgraded train cart, if i wont make it on time to work! Why are the windows always filthy? Morning, noon and night? If a mid-life rehab (industry standard) had been done about a decade ago of these cars they could have lasted 40 years. I understand even Art Leahy has conceded this. I bet someone who has high platform boarding buys these when we retire them, does a rehab and gets at least 10 more years out of them. Given how many rail cars cost these days, that would be a bargain for whoever does it that needs to expand their fleet. Are you sure these cars have been repainted? What’s with the 1990s-era yellow striping? I thought the rail cars were going to be repainted silver like the Gold Line railcars. Sure seems to be taking a while for this “new” livery to be rolled out. That’s good, they needed it the inside is always so dirty. The outside look good with new paint! Hey why don’t they make them color coded? Blueline- Blue, Red line- Red, Greenline- Green , Goldline – Gold & so on. Or at least change the ugly yellow stripe’s to colored ones. Makes sense to me, just a what I think. These LRV are reaching above 30 years old and having relatively 1.7++ million miles. It’s quite an overhaul to convert these rolling signs to LED and not disrupting all of the old technologies on board. 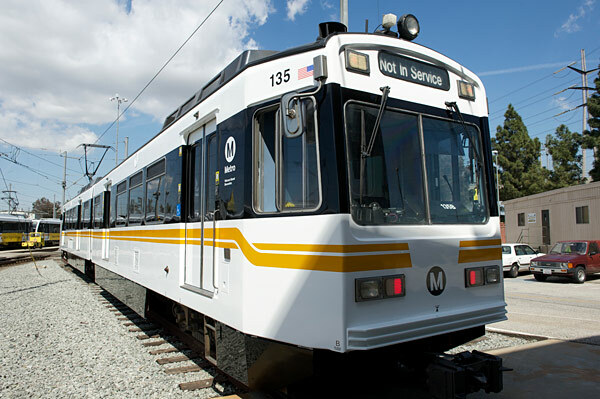 If Metro does this and any new problems that arises will lead to more downtime and with the demand of public transit being on time its quite hard to have things running smooth and upgrading things while launching the new Expo line. I believe that’s why there’s a big push for hiring to keep up with the expansion and keep these overhaul projects in the background. I think they kept these trains running at its optimal level considering that these trains have so many mechanical and electrical parts to maintain and old technologies that may no longer or is manufacture for them. Really? 2012-1992=20 if I did the math right.